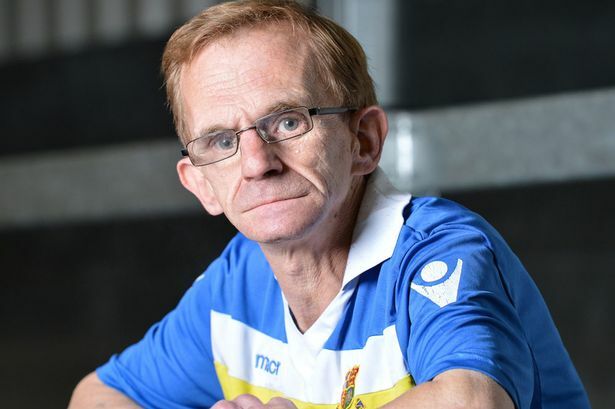 It’s impossible to resent the Wealdstone Raider, argues James McGlade. Eyes agog, the most unlikely challenger to Simon Cowell’s empire launches a taunt at the pop mogul as he promises to take the Christmas number one slot reserved for the winner of the X-Factor. His trash talking can be seen on Vine and Instagram but quite frankly it’s hard to browse through any social media outlet without bumping into the viral sensation that is the Wealdstone Raider. How did a foul-mouthed middle-aged football fan come to tussle with such massive personalities? The internet, that’s how. The video that catapulted Gordon Hill to stardom was put up nearly two years ago but he’s only tapped into his popularity in the last six months. In an ironic twist, he’s lost some fans due to this development. In fact, the reaction from some corners to Hill’s pursuit of that Christmas number one slot was annoyance. The joke is no longer funny, they say. This is because Hill is using his famous diatribe to build his brand. His Twitter account is full of tweets directed at celebrities in which he’ll either tell them they have no fans or ask them if they ‘want some’. He’s milking the joke mercilessly yet I don’t think I’ll ever tire of the Wealdstone Raider. Cue confrontation as this would-be hooligan almost blindly issues a challenge to a duel, turning on his heels at the sound of a voice that’s raised as high as his. The ludicrous rant is comic gold. I’m in convulsions every time without fail. However, I feel quite sympathetic towards the man. Deep analysis probably isn’t required for this video but Hill looks uncomfortable before he lets rip. He spares one or two anxious glances toward the camera. He knows he’s being filmed. It isn’t outlandish to imagine that he had been on the receiving end of a few piss-takes prior to this bout of candid camera. He stands at a titchy 5’2, he’s got a speech impediment and a physique that has been compared to that of E.T. to name but a few of the characteristics that bullies could prey upon. A 48-year-old man who is unmarried, it appears that Hill, holding a cigarette in one hand and a beer in the other, is at the game on his own. To confirm his vulnerability, a stranger wants to record his antics so that he can become the laughing stock of the internet. Except it’s not as funny when the person you’re mocking embraces his own deplorable behaviour. Hill acknowledges that he was acting like an idiot that day and wanted to hide behind the sofa in the ensuing weeks and months after the video was devoured online. But it wasn’t going away anytime soon so he got himself an agent and began to make money off his notoriety. He’s been appearing at nightclubs, posing for pictures and has been brainwashed to include his buzz words in every line he speaks. It’s extraordinary. The single he has released (creatively titled Got No Fans) is fairly awful. But even though it doesn’t work in practice, it’s still hilarious in theory. While listening to the song, it’s not the product that tickles you but the idea that this builder has been launched into stardom by public demand. Can’t we forgive his shameless flogging when he’s tackling despicable figures like Cowell? Personally, it would be great to see him remind the likes of Irish Water and Al-Qaeda about how unpopular they are. Like a cursing Gandhi with a slightly more hands-on approach, Hill represents a section of football fans who have been snubbed. Sunday Times columnist Rod Liddle recently wrote about students from Brighton studying the animals that came in the form of visiting Millwall fans to Falmer Stadium. The sociology scholars were disappointed that no misogyny, homophobia or racism was displayed to vindicate their condemnation of the working class. If Hill had not come out of hiding, the verdict that he was a raving lunatic would have been accepted. Now we know that he was drunk and irritated. We don’t condone his actions but, if anything, they expose the childish and trivial nature of hooliganism in football. He has proven himself to be a nice guy who has already raised £10,000 for charity and wants to raise more with his charity single. Hill had been treated by Great Ormond Street Hospital almost from birth up until the age of 15 due to toxoplasmosis. Now he’s showing his gratitude through large donations, along with other hefty amounts given to Autism Concern and Wealdstone Youth FC. A true supporter of his local team. This hasn’t won everyone over. Hill apparently regularly receives death threats over the phone. But when he’s not taking verbal abuse, he’s reportedly negotiating to appear on Celebrity Big Brother. There will always be resentful folk who begrudge their jester the silver he is due. You never know, he might even make good television. Even so, a crowd of bitter dissenters will gather to brand Hill a fame whore. One jibe that they certainly can’t throw at him is that he’s got no fans. Back Chelsea to beat Derby at 7/2 odds!!! Click here to bet on Chelsea to beat Derby at 7/2!!! !